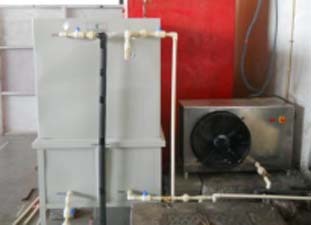 It is introduced between compressor and condenser of Air conditioner. Gas is recovered from A/C. Discharge pipe is cut and Desuperheater is brazed to it and other end to condenser. Inletand outlet connections are made for cold as well as hot water. 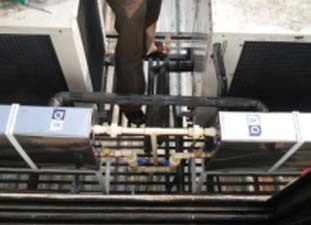 Performance of air conditioner systems improves significantly when properly designed and integrated. 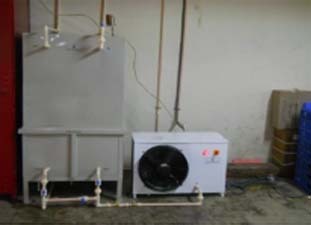 It, not only gives free heat but also reduces power consumption by 5 to 10% and increases cooling capacity by 5 to 10%. 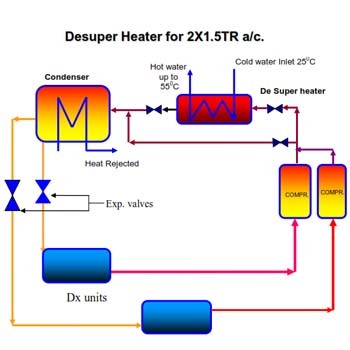 Superheat recovery reduces load on condenser which results in reduced condenser pressure, increased sub cooling at condenser outlet thus leading to increased C.O.P. and cooling capacity. Tube-Tube Heat Exchangers (TTHE) design uses a judicious combination of bends, straight lengths, tube diameter/s, tube material/s, thermal bonding material to enable multi-stream multi-phase heat transfer. Variation of mass flow rate of fluid stream/s at intermediate stages in a single TTHE is possible. It offers a double wall vented design which eliminating problem of mixing of fluid streams in case of leakage and offers the flexibility of utilizing different conduit materials that are compatible with the individual fluids. With inlet/outlet temperature of 25/550C Hot water rate will be 225l/h. Considered rate of Rs 9/kWh Saving will be Rs 20.90 per hour. McDonalds in South and Western India.